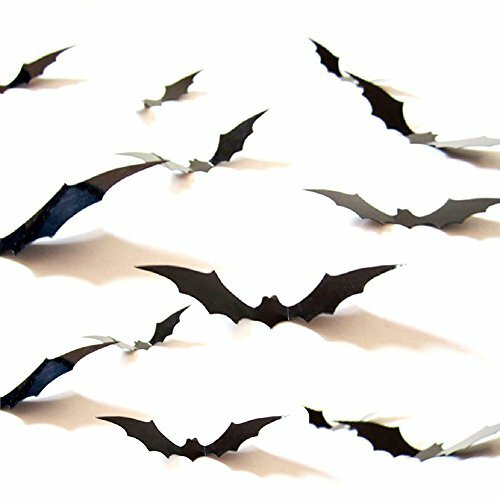 Here are Some of the Best Cheap Halloween Decorations! 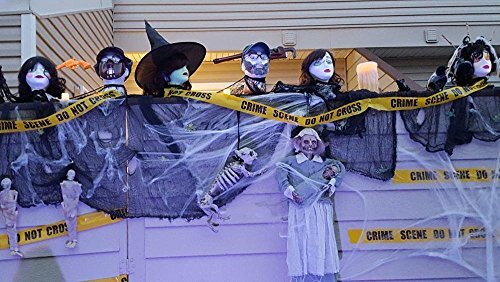 Whether you are looking for cheap outdoor Halloween decorations or indoor ones – this list is for you! 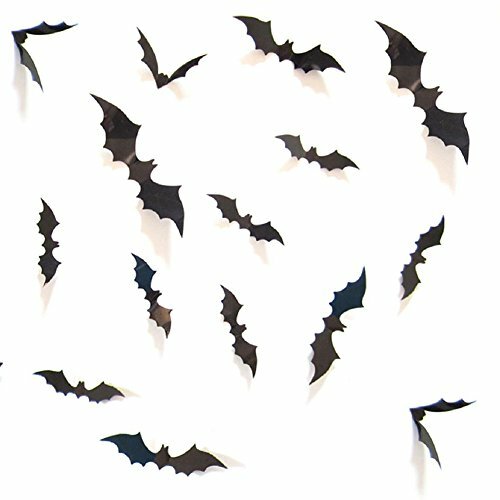 We LOVE Halloween – Bruce has a great history of amazing DIY costumes (and we’ll write a whole post about them soon)! 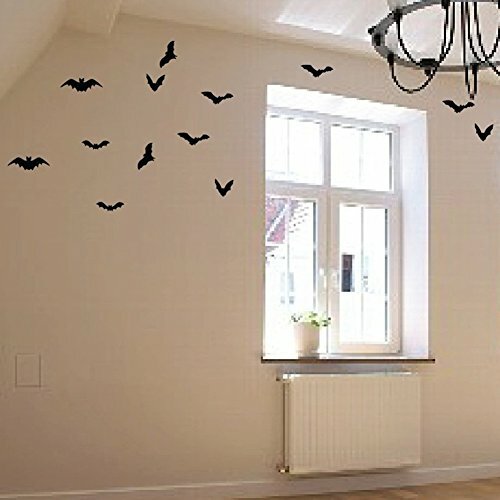 Now, there are lots of great DIY Halloween decoration ideas – but for those pinched for time, buying cheap can go a long way to creating the perfect spooky decor! 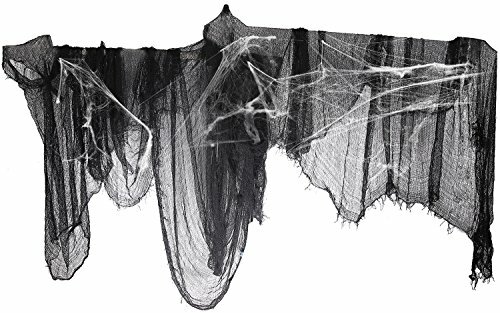 Check out these clearance Halloween decorations that are sure to sell fast because they go in any yard or house and make great add-ons to your overall October decor! 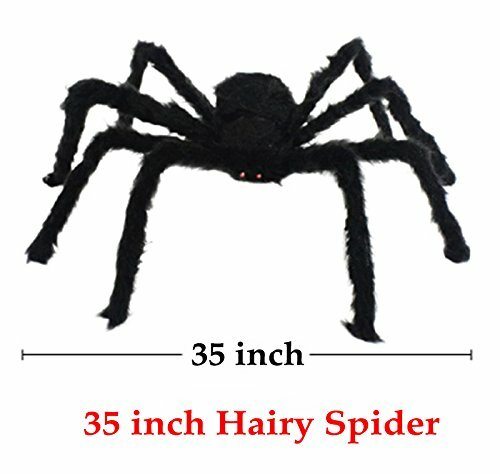 Okay, we know that spiders often creep people out. 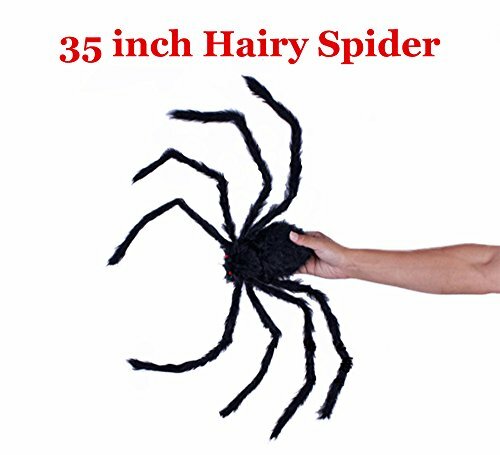 Well, these are sure to do that as well! 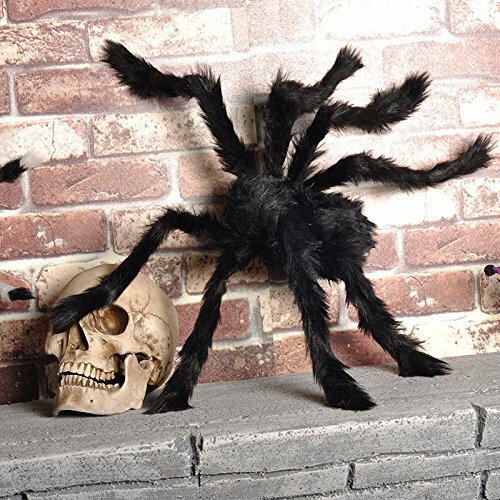 These giant furry spiders can go anywhere you like to make your decor a little creepier. 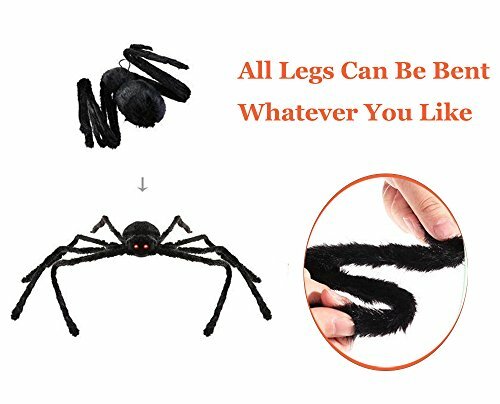 The legs are moveable and you can hang them from the ceiling or a tree – doesn’t matter! 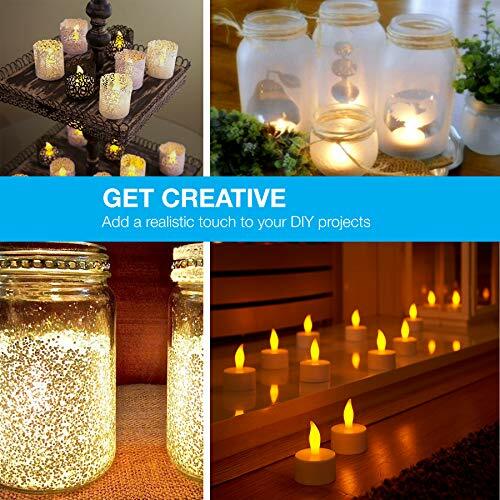 If you are hosting a party and need a decorative cover for a mantel or table, this can do just the trick. 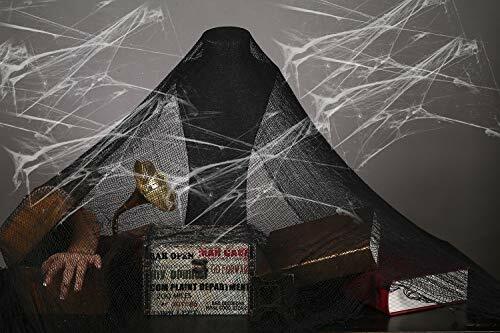 This black covering gives the effect of webbing as well as a creepy aged tapestry that’s been gathering dust for a while! 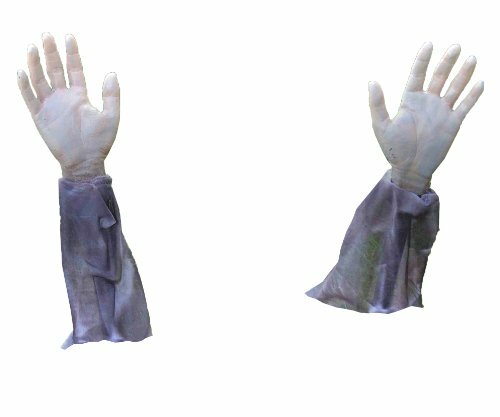 You can even drape it outside to create shadows from shrubs or the patio! 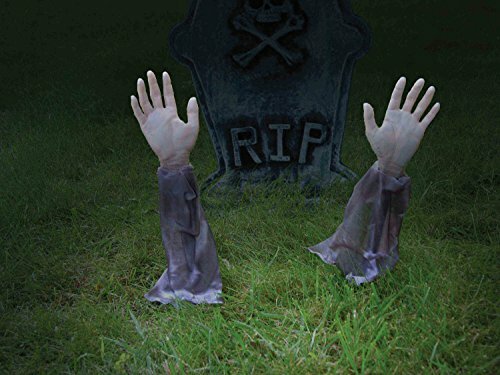 Zombie decor is always in – and a surefire way to add to your lawn is with these classic hands. 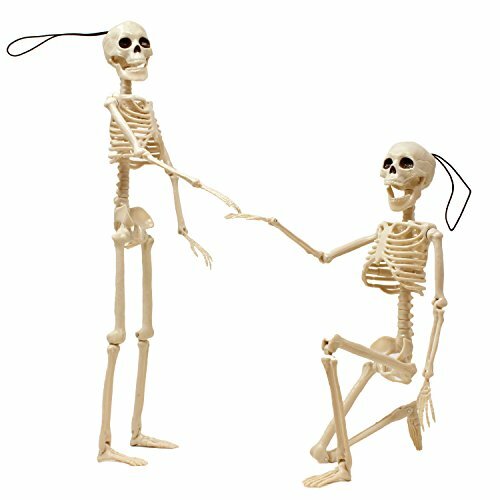 Seeming to “crawl” out of the ground – but secured easily with pointy garden stakes – these hands are moveable. 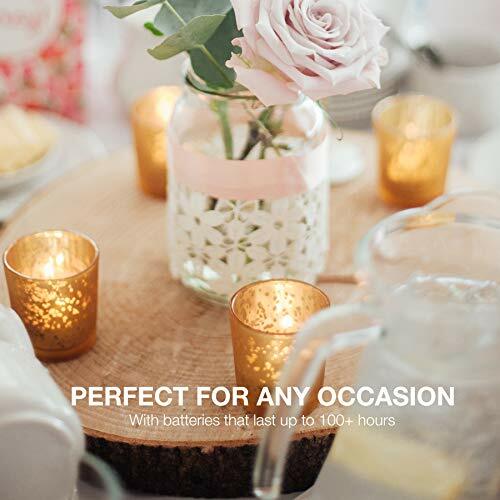 This means that you could change up the decor night after night if you really wanted to! 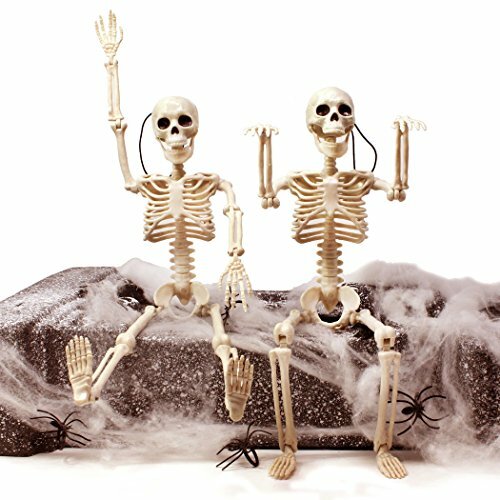 Get This Pair of Funny Bones! 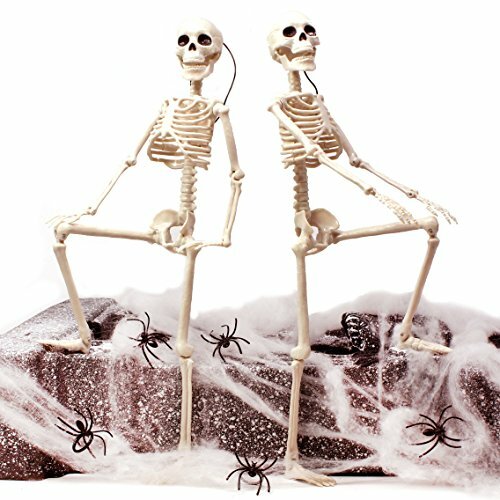 Are you looking for two hilarious flexible skeletons you can move into any position? 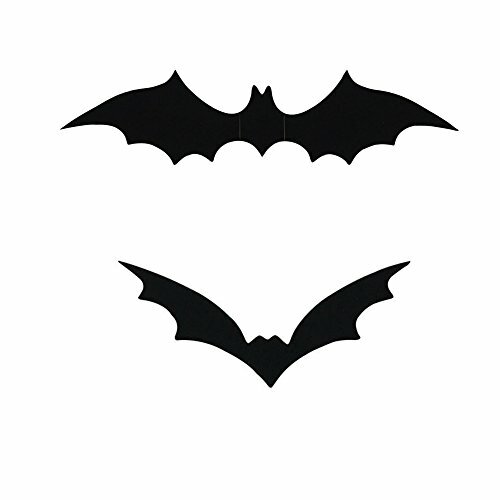 Then these two are for you! 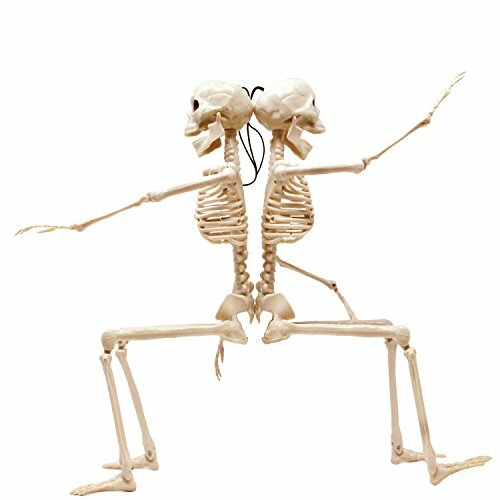 Sold as a pair, these skeletons are a great decor item for a dinner table, snack table, outside on the porch, or simply hanging from a tree! 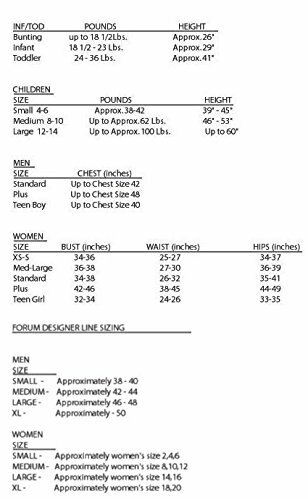 You can do what you like to make these boneheads work for you! 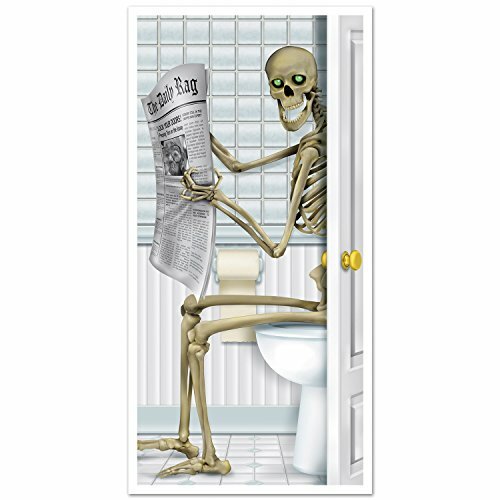 If you need other funny things – you might find a funny mug that suits your tastes for the holidays! 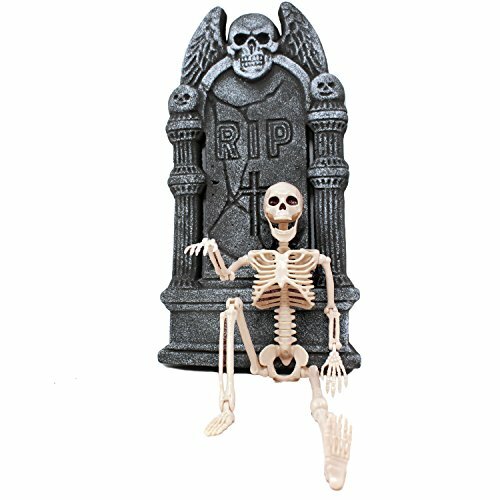 Got some bare space that needs a little spooking up? 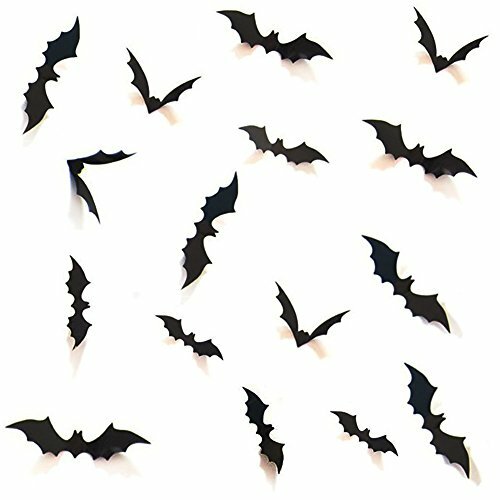 These stick-on bats are sure to do just that! 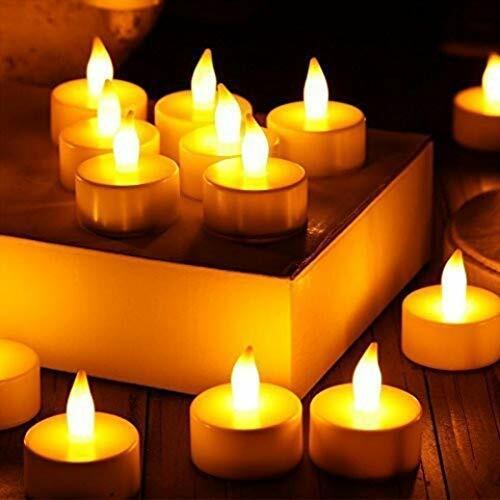 Coming in all different shapes and a variety of sizes, you can put them together in a group, or choose to use them as singles around a larger area or room. 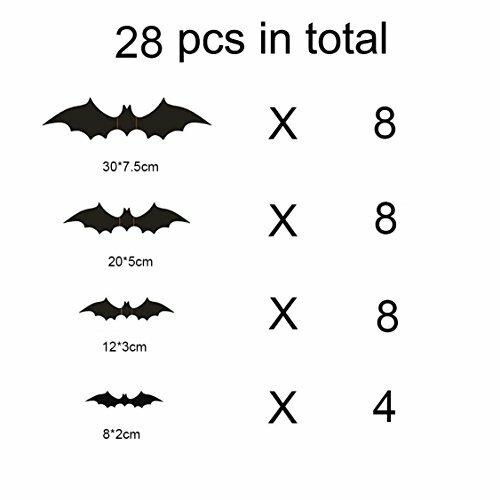 Use your imagination – you’ve got lots of bats if you buy them! 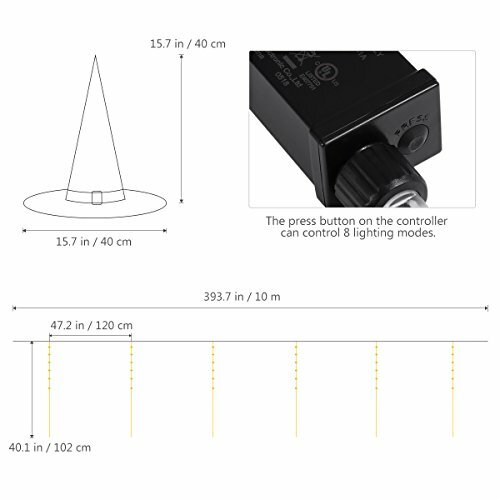 We really like these lights. 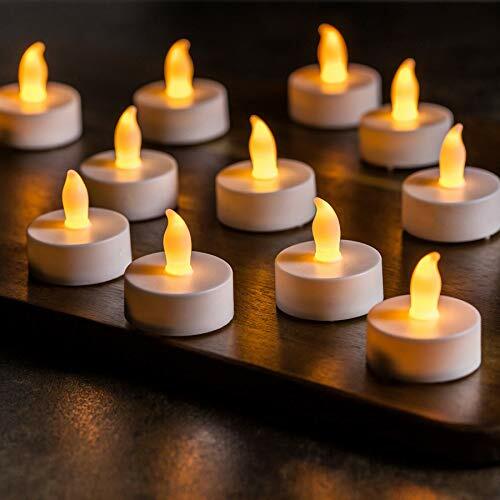 Here’s a simple decor piece that’s sure to light up your steps or patio. 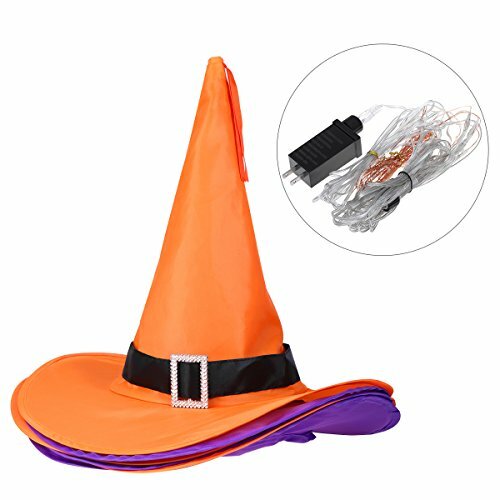 They are both functional to help those trick or treaters find the doorway and practical since they aren’t a real flame! 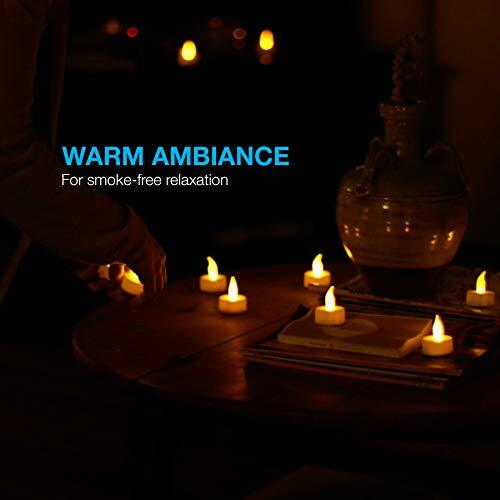 Easy atmosphere addition, easy clean up! 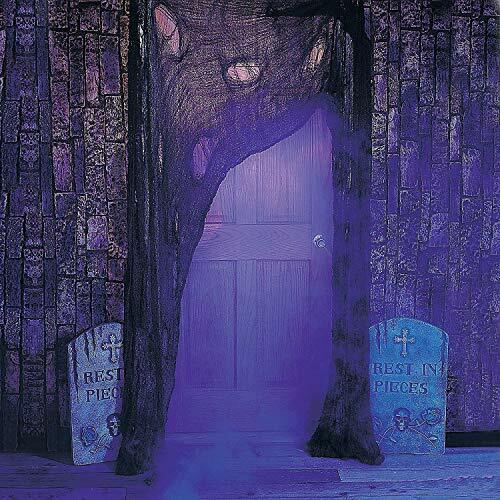 Perfectly creepy and still affordable, having a hanging corpse in your yard is a great way to add to the creepy effect you have going on with your Halloween decor! 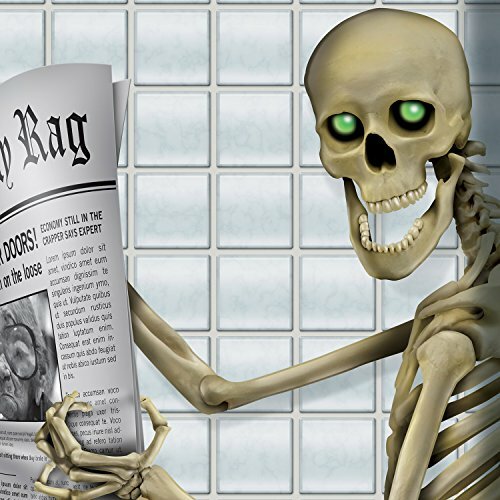 Just look at the face – it’s actually super spooky. 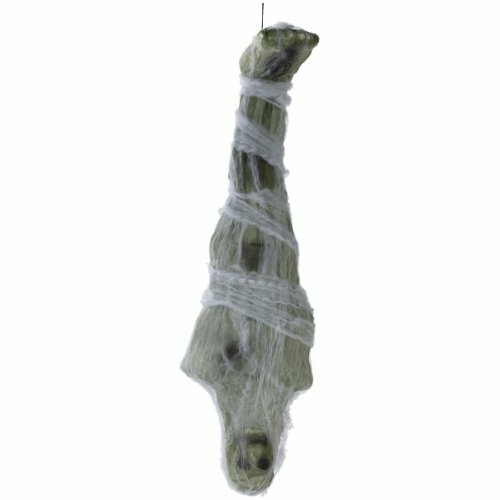 This is an item on the list that lacks the “fun spooky” aspect and goes right for the “really scary” feel! 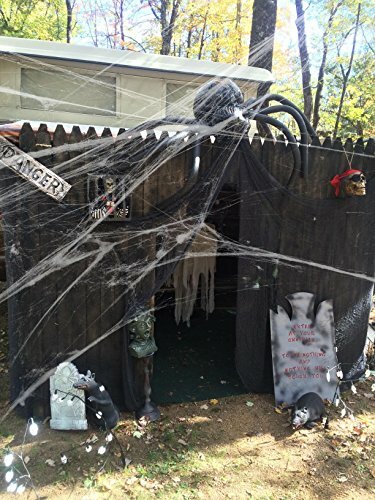 Got a door that needs a great covering? 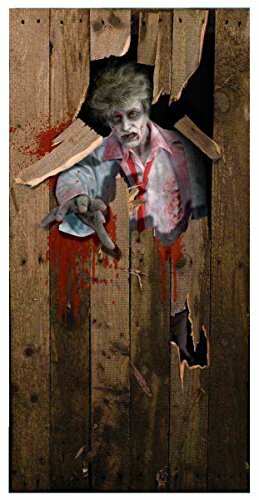 Got a thing for zombie decor? 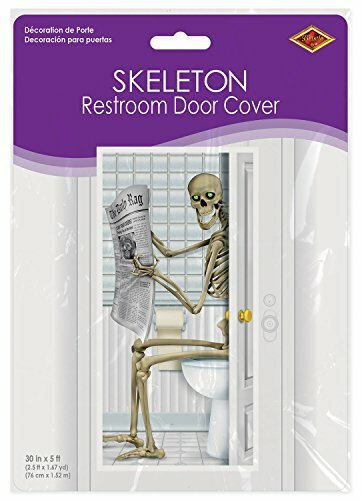 This door cover is for you then! 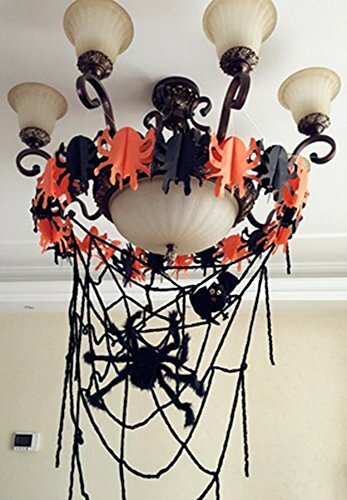 The design is enough to give anyone a few chills – and you could certainly give trick or treaters a bit of a scare when they come to the door! 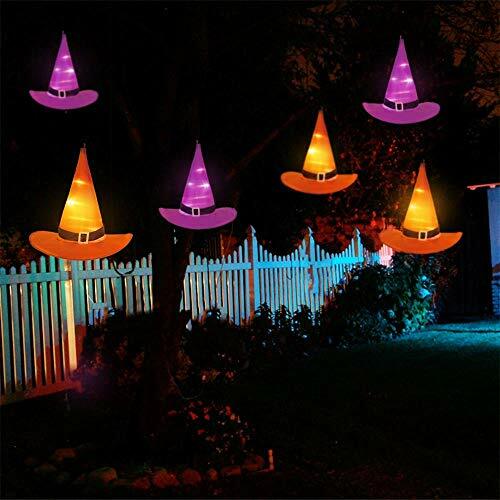 Looking to light up the yard in a fun and quirky way? 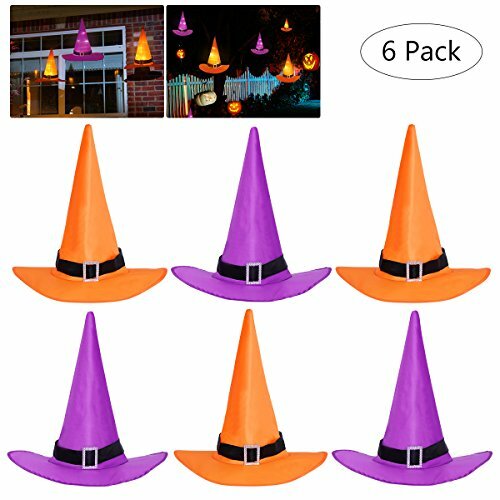 These witch hats are sure to do just that! 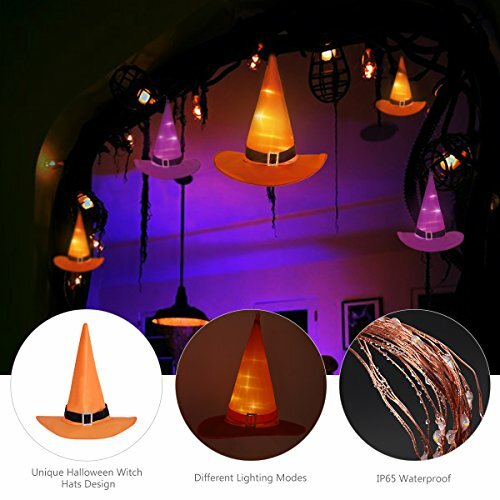 These hats are water-resistant and even come in selectable lighting modes. 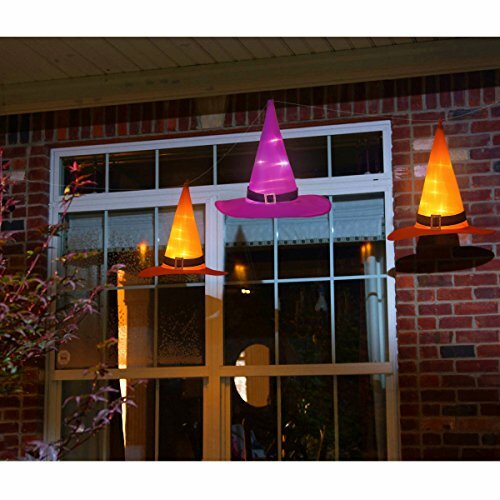 This means you can control the mood outside your home to the color scheme you want! 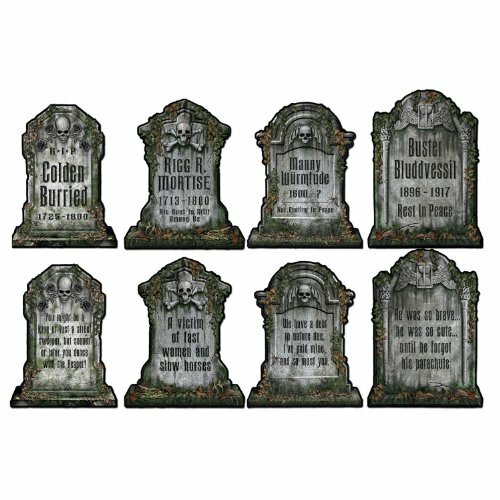 No front yard is complete without these hilarious (and often tacky) tombstones! 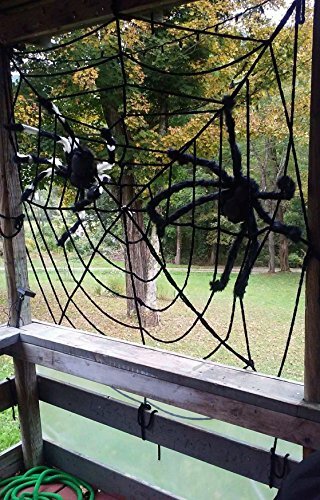 Featuring funny names, they are sure to make your visitors have a chuckle while still adding to your outdoor decor. 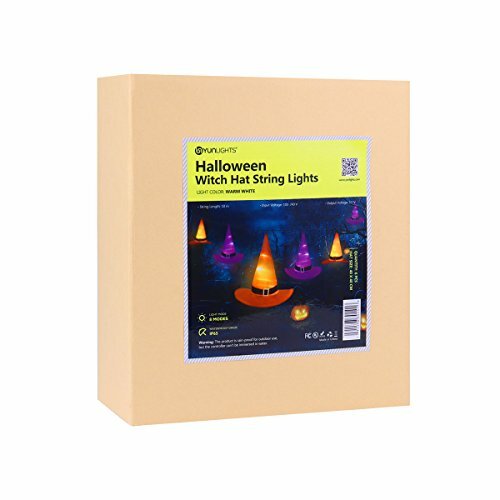 However, you can use them inside if you need to theme a haunted house or otherwise! 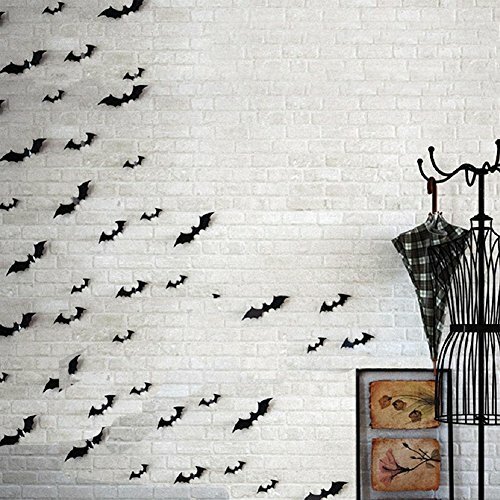 This is probably the most classic of cheap decor items – but for good reason! 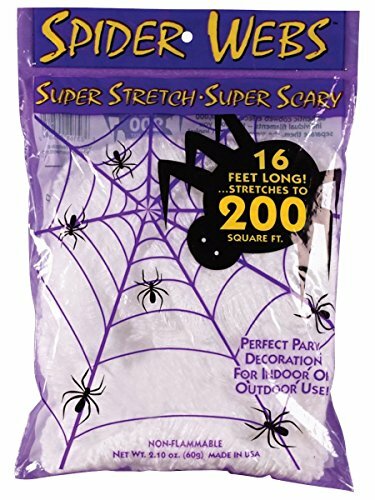 White fake webbing is a great prop and addition to any decor. 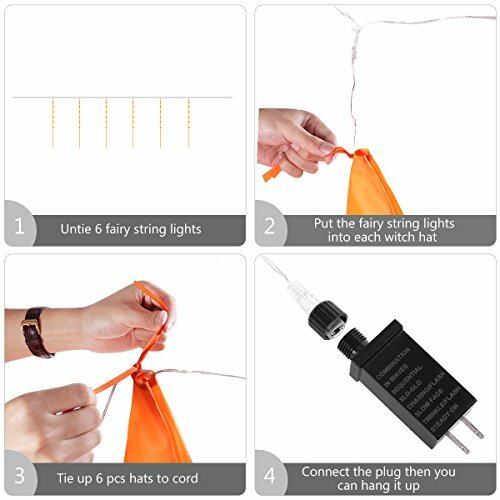 It’s vertsitle for stretching, is great for hanging/sticking smaller items or creatures into, and is – best of all – very cheap! 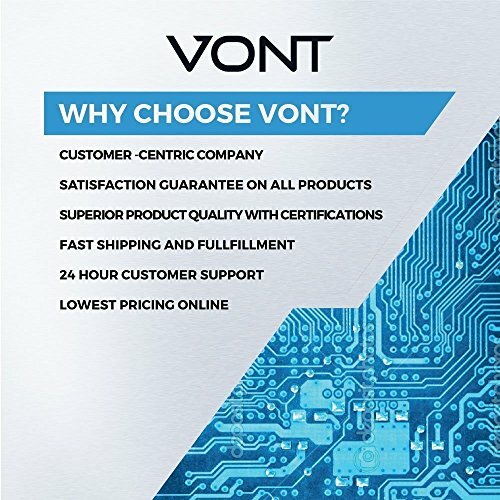 One package goes a long way! Browse through the photos – you can’t tell us you didn’t chuckle! 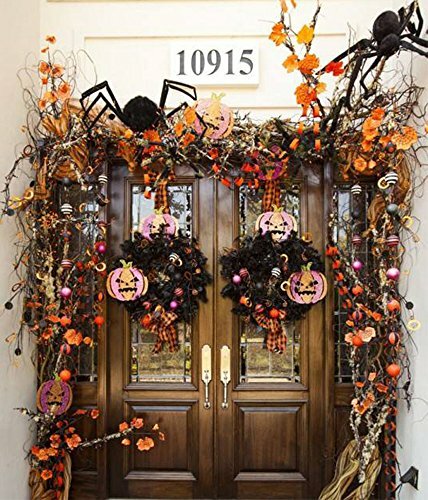 Okay, so it might not be the spookiest of decoration items but thie door cover is themed right and perfect for your holiday party. 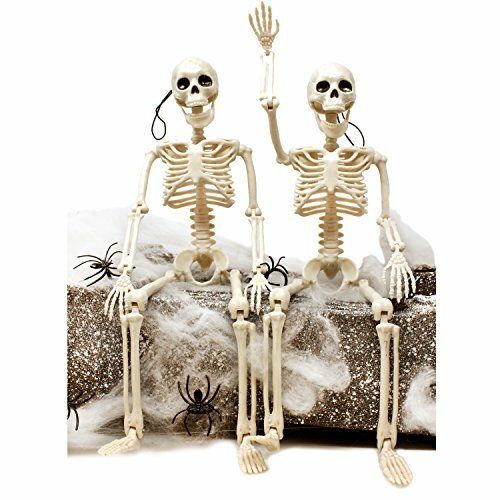 Your guests (or dorm neighbors) will be laughing all season up until the big night! 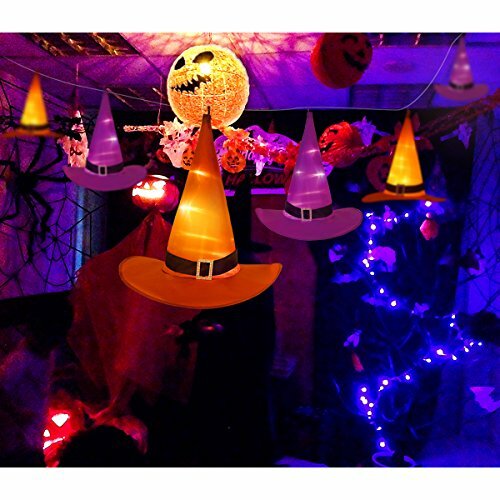 And there you have it – some of the best cheap Halloween decorations on the market right now! 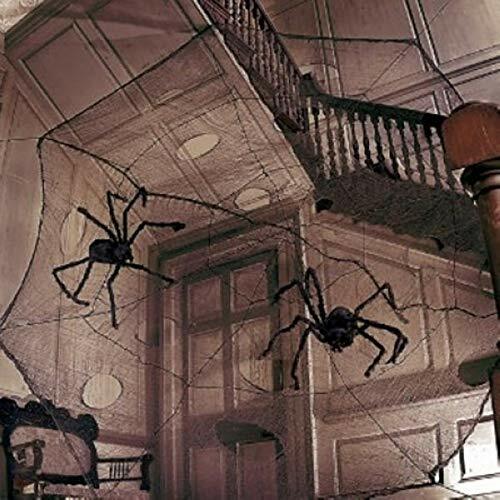 Let us know if you end up decorating your spooky house with our inspiration – tag us in a photo @boardandlife on Twitter since we don’t have Instagram yet!